Elevenses … or why am I always hungry? A typical elevenses? Don’t worry. I didn’t eat everything pictured here. At least, not yet. 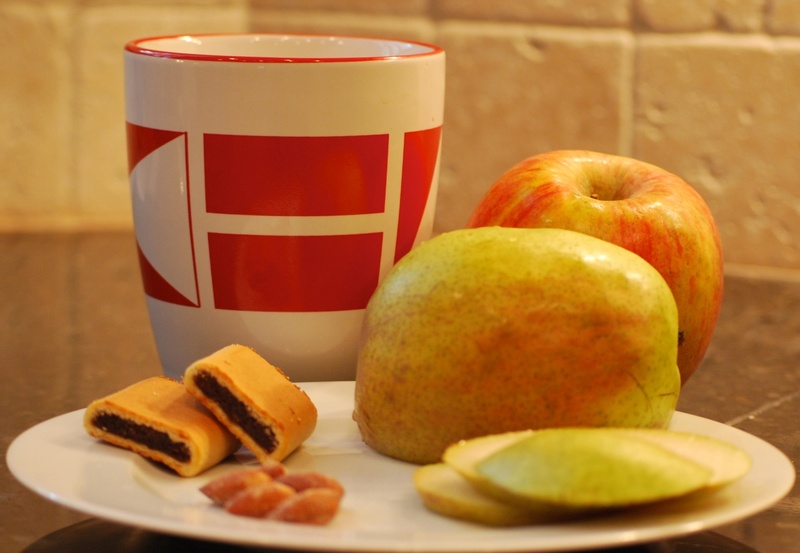 Do you take an elevenses during your day? And then follow it up with lunch and an afternoon snack and then dinner? More and more these days, I find myself adding in snack times such as elevenses to my day. You may recall that I’m training for my first marathon, now three and a half weeks away. Two weeks ago, I did my longest run ever: 20 miles. Yes, all at the one time. And, no, nothing was chasing me. This week’s long run will also be my longest ever: 22 miles. And then a blessed training element called a “taper” arrives: a three-week period where I won’t increase my distance, letting my legs rest a bit in advance of the big event. What I noticed almost immediately after my 20-mile run was that I was constantly hungry. You know the story The Hungry Caterpillar? That’s me, though I’m trying to be more mindful about what I eat than the caterpillar, trying to heed the cautionary words of a dear friend who said she *gained* weight while training for her first marathon. It doesn’t help, though, that I get really hungry every few hours. Pippin: What about elevenses? Luncheon? Afternoon tea? Dinner? Supper? He knows about them doesn’t he? This scene in the movie ends with apples flying at Merry and Pippin (courtesy of Aragorn, who already cared about these hobbits, even if their petty concerns perplexed him). Merry and Pippin are focused on habits from a life of leisure that is no longer theirs. The very forces of evil are tracking them to kill them, and all they can think of is filling their stomachs. Meanwhile, Aragorn wants them to focus on what’s more important: staying alive and finding safe sanctuary. Perhaps their focus is a strategy to cope with the fear they’re facing on this strange and dangerous journey, or maybe it’s their way of bringing some small comfort and happiness into their hard days of running and hiding. All of which reminds me of our human tendency to focus too much on food. Perhaps, like the hobbits, our focus stems from something similar: an attempt to cover up fear or to find joy and pleasure when we’re unhappy or even to ease boredom. There are lots of reasons we may find ourselves eating too much. In last Wednesday’s post about lessons from nature, I mentioned a conversation Jesus had with his disciples, telling them not to worry about what they were to wear or eat (Luke 12). As God in human form, Jesus understood the craving for food (it was one of the ways Satan tempted him during Jesus’ 40 days in the desert), but He also knew not to focus on that physical hunger. Instead, He asked his disciples to rely on God to provide for their physical needs so they could focus on spiritual imperatives instead. When we find ourselves craving an earthly thing (food, clothes, companionship), it’s time to stop and ask why we have that craving and whether the craving will draw us closer to God or pull us away from serving Him. I’ve mentioned Lysa TerKeurst’s fantastic book Made to Crave before. And if you’re struggling with a craving that has knocked your life out of balance, I encourage you to pick up a copy. She also has a new edition of the book geared specifically toward young women (though I think men should read it, too). In these books, TerKeurst describes the nature God put in each of us so that we would crave Him, and yet so often, we crave something other than Him, a thing that can never satisfy. I know my craving for food right now has come from a physical necessity to fuel my extra miles of running each week. But I also know that I have to lean on God to help me make the right choices and stay focused on other aspects of my life. I’ve asked for His help to keep me focused at the grocery store so that I fill up my cart with good, healthy choices instead of harmful ones. I mean, I love a cheeseburger and fries as much as one girl can, but I know it won’t help my running, and it won’t keep me satisfied any longer than a healthier choice. Plus, much as I adore hobbits, I don’t want to end up looking like one as I head into my training taper. Do those of you who are marathon runners out there have any non-hobbit-like eating advice for me as my first marathon draws close? Are there any of you with a craving of your own that you have successfully tackled or are trying to tackle? Please share your story here. It may be exactly the encouragement someone else needs to read today. Want to enlist a prayer warrior to lift you up in a particular struggle? I’d be honored to pray about your struggle on your behalf. You may share your request in the comments below, or, if you prefer, you may email me your request. This entry was posted in flourishing tree and tagged elevenses, food, hobbits, hunger, hungry caterpillar, JRR Tolkein, Lysa TerKeurst, Made to Crave, running, weight by hopesquires. Bookmark the permalink. I haven’t had any ice cream in 12 weeks! 🙂 i’m working on sugar and self control. I’m also trying to exercise daily. I’m doing pretty good. I’ve completed my 10 week goal of exercising 6 days a week and eating healthy. I didn’t do very well the week of Easter, but I’m now on my 12th week of eating and exercising. I’m even attempting running. My weight hasn’t decreased but I have lost an inch. Great blog. Love to you. Thanks for the reblog. I can no longer see your blog on WordPress, but I wish you the best of success in attaining your weight loss goals!